I did not know that some people really cared. But here is a clip on Iran's "National Car Museum". You can see the Coronation Carriages. The last Shah's Carriage is at the 6:55 minute. Many of us are lonely, and many of us need to have friends. Kheyli az maha tanha hasteem, va kheyli az maha doost lazem dareem. I am an Iranian Astrologer, that can guide you in your relationship. Man yek monagem eerooni hastam ke mitavanad dar ravabetoon komak bekonad. Provide your time and date of birth to find friends. Tareekh va saat tavalodetan ra bedeed va doost peyda bekonid. This vast and mysterious dark energy appears to gravitationally repel all matter and hence will likely cause the universe to expand forever. To me that seems so much like the dualism referred to in the Zend Avesta. This is a superb commercial. I think it must have something to do with, the subtle connection between the two sticks, and the two lines pouring down from the glasses. Ostad Ebrahim Pourdavood - The story told by his daughter. 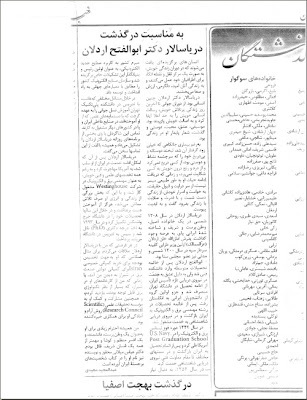 This clip will tell you how the language of Avesta was brought back to Iran, by the world foremost Iranologist. It is so sad to hear, that ancient Iran was better known by non Iranians, or Iranians living outside Iran, until Ostad Ebrahim Pourdavood came around. And of course now, with the mess that Iran is in, it so important that we all find a new Spirit to recreate a new Iran. Learn and enrich your soul. Many thanks to Niloo for finding this. And yet another video clip on Iran. If the weight problems can indeed be overcome, the potential benefits of electric wheel motors are undeniably extensive. There is mechanical simplicity because the power source is within the wheel and has no mechanical link with the rest of the car; there is no engine under the bonnet, no exhaust under the floor, no gearbox, differential or driveshafts. This releases a lot of space; the batteries, which represent the largest additional mass, are relatively compact and can be situated where they have least impact on vehicle dynamics. There is multiple redundancy because each wheel can operate independently, offering extra layers of facility to electronic traction control and stability systems, plus infinitely variable all-wheel drive that is easier to control because there are no mechanical systems to be linked. The shape of transport as I see it. The Brits are winning. I heard just recently of the passing away to the other side of Abolfath A Ardalan. He was one of the few relatives, that I can honestly say, came to my level. One of the problems I have always had with the older generation of Iranians, was that they were far too snobbish, and arrogant. This man was not. Considering his amazing credentials and intelligence, and moreover the pedigree, he showed the greatest ability to reach out anyone. His smile was what linked you to him. I must say, all Ardalans were gifted in the art of diplomacy, and Abol was also a great engineer, and served in the Imperial Navy of Iran. It brings tears to ones eyes to see such great men go, and my greatest condolences to all Ardalans. Click on this link to see some of his achievements. Can someone give me a better one please? The Ardalans themselves were rulers of the Kurdistan for thousands of years. In fact in very old maps of Persia, you see Ardalan written instead of Kurdistan. 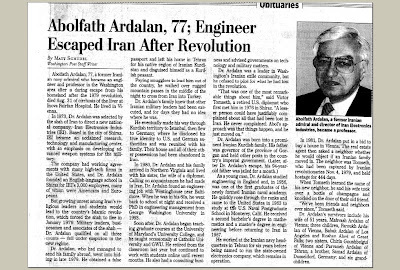 But in recent history the Ardalan became important dignitaries in Iran, with many achieving amazing standards in University Degrees and Foreign Ministerial capacities in the Iranian government. Primary Tower on Flickr - Photo Sharing! A friend of mine at iranunited posted this joke, and it is quite meaningful and funny. "Excuse me, can you help me? I promised a friend I would meet him an hour ago but I don't know where I am." "Well," answered the balloonist, "everything you told me is probably technically correct, but I've no idea what to make of your information and the fact is, I'm still lost. Frankly, you've not been much help at all. If anything, you've delayed my trip." "Well," said the woman, "you don't know where you are or where you're going. You have risen to where you are, due to a large quantity of hot air. You made a promise, which you've no idea how to keep, and you expect people beneath you to solve your problems. The fact is you are in exactly the same position you were in before we met, but now, somehow, it's my f**king fault. I think these are a very cute set of photos. Who wore this 82,000 year old necklace? I am a great believer of the civilizations that existed more than 50,000 years ago, that is referred to as Atlantis. There is a presence, and a thrill when I think of them. “In 2003 in Morocco we first discovered a single perforated shell, but we worked for four years to arrive at a dozen of the Nassarius gibbolosus (sea-shell) type,” he said. ... Bouzouggar headed an international team of experts working with Nick Barton, a researcher from Oxford University in England, at the Pigeons’ Cave at Taforalt, 20 kilometres from Berkane. ... He said the team had used four different dating systems which had given the same result, an age of around 82,500 years. Apple iPhone and HTC Touch - (Un)official Comparision!! Hey if you like to listen to some funky Iranian music, and compare the iphone with htc, then watch this. Agar deleton mekhad yek ahang funky va appelo ba htc moghayeseh bekoni, een clip ra nega kon. Lets say one of your hands is holding a phone or a mouse, or of course the wheel (don't do that). This is an easy way to solve your problems. And it is not an Apple. click here and then hit F11 on your keyboard to see it properly. Then click on the Now button to see the changes in births, death, world temperature, and a lot of other stuff, from the moment you clicked. I think you will realise what is really going on in this world, that you just did not know about. This is a lovely performance, in respect of Zoroaster, and Zoroastrianism, by Tajiks who are our distant cousins. Click this link to see some great morphs. It is not too often that you can see how obvious a card trick can be. A lot people think Iran is all about Islamic fanatics. Think again. This clip really brings back memories to me. Steve McQueen is my favourite. Take a look at this website, where the author Mike Mike are trying to find the face of tomorrow, with composite photos. The argument between these two guys is really funny. The clip shows how you can move your finger across the screen and make it flip albums and zoom into photos. But there is no bumpy feeling that you get with a normal button.